The Dalai Lama — on a visit to Taiwan that includes prayers for recent typhoon victims — has rebutted China’s claims that he is there for political reasons. In a Monday interview with CNN’s Sara Sidner, the Tibetan spiritual leader said he was visiting the island to comfort victims of Typhoon Morakot. He added that he would not meet Taiwan’s President Ma Ying-jeou, to avoid politicizing the trip. The Dalai Lama was in southern Taiwan on Monday to meet and pray with survivors of the disaster, a day after he arrived from India. Morakot caused heavy flooding in the south and killed more than 500 people when it struck August 8. “As a Buddhist monk, it is my moral principle to go there, see them and at least share some of their sorrow, some of their sadness,” he told CNN shortly after he arrived on Sunday. China’s state-run Xinhua news agency said Sunday that Beijing maintained “resolute opposition” to the visit, which it said “is bound to have a negative influence on the relations between the mainland and Taiwan.” “We will keep a close eye on the situation,” Xinhua quoted an unnamed spokesman for the government’s Taiwan Affairs Office as saying. 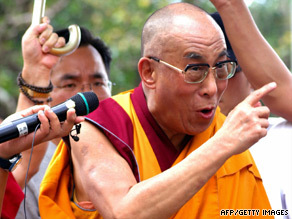 Beijing considers Taiwan a renegade province and accuses the Dalai Lama of advocating Tibetan independence from China. The Buddhist leader is to give a public talk on compassion and religious harmony before returning to India on Friday, his spokesman, Tenzin Taklha, said last week. Typhoon Morakot dumped more than 3.3 meters (100 inches) of rain on the island before moving onto the mainland. The resulting flooding and landslides killed at least 543 people, Taiwan’s Central Emergency Operation Center said last week, with at least 117 more still missing. Rescuers struggled to find many of those who were missing in the island’s remote southern mountains, and Ma apologized last week for the government’s slow response to the disaster.